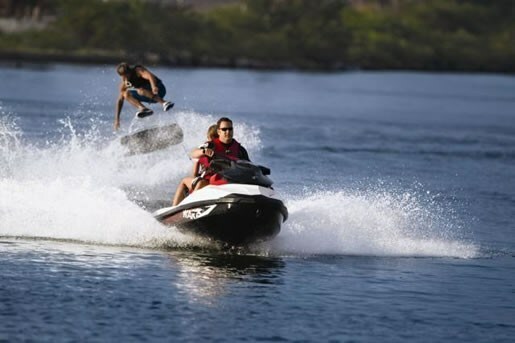 It’s great to see a watercraft manufacturer like Sea-Doo embracing all aspects of water based sports and recreation. The Sea-Doo Wake 155 doesn’t just embrace wakeboarding and wakeskating, it’s 100% all over it! This personal watercraft has been totally designed with the wake warrior in mind. Whether you’re strapped in or foot loose and fancy free, this is one watercraft you can really get behind. The 2011 Wake 155 features a new hull design that is lighter, more responsive, and more fuel efficient than ever before. It has plenty of power and provides even, consistent pull allowing the rider to get up quickly and without effort. The wake it produces is substantial and is certainly ideal for wakeskating but also offers enough of a boost for full sized adult wakeboarders as well. However to pull off the really big tricks, experienced riders might want to check out the Wake Pro 215, Sea-Doo’s slightly larger, heavier and more powerful wake specific watercraft. But for the entry-level wake enthusiast the Wake 155 will still perform very well. In addition to the re-designed hull, the Wake 155 also has some other very interesting and incredibly useful features onboard. For instance, it comes standard with a removable board rack that allows you to carry your board on the side of the watercraft. It’s made of rugged, durable rubberized plastic, is very easy to pop on and off, and securely holds your board with two rubber cords. Also very helpful are the wide-angle mirrors that allow the driver to keep an eye on the rider being towed behind the craft. The most functional and wake specific piece of equipment onboard this watercraft is definitely the 3-position ski pylon. It is a well designed and equally well positioned apparatus that functions as both a place to attach the towrope, but also as a place for the spotter to hold on to. It features spotter handgrips and has room for rope storage, as well as being completely retractable so it can be stowed away when not being used. The stern of the Wake 155 has also been designed with the wake rider in mind. It’s large enough to hang out on when getting ready for a run, or taking a breather after catching some air. Riders will also appreciate the fold-down reboarding step at the rear of the craft. 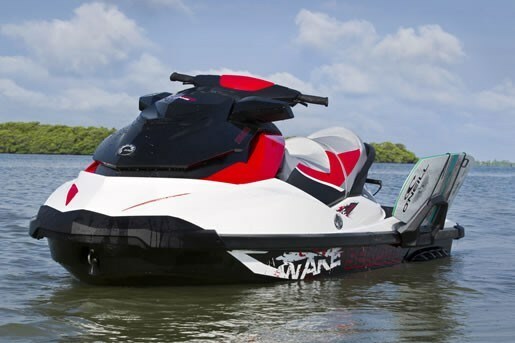 The Wake 155 is loaded with electronic control features. Most notable is the Ski mode, which features five unique acceleration settings that can be set and adjusted based on the skill level of the person being towed. In all the Wake 155 boasts 26 functions, some of which include: a Touring/Sport mode, an ECO mode (helps improve fuel economy), Slow mode, cruise control, and a manual Variable Trim System (VTS). The Wake 155 seats 3 people, (conveniently enough, a driver, a spotter, and a rider) which makes it perfect for grabbing a couple of friends, a couple of boards, and a whole lot of air. It comes in Wake Red, and looks every bit as sick as the tricks you’re going to pull while riding behind it.